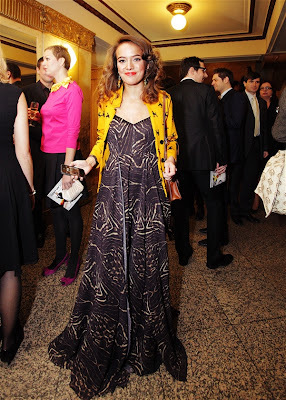 Tereza Voriskova is a Czech actress and she wore this dress to the Czech version of the Oscars. She was criticized for the combination of this H&M dress and the juvenile sweatshirt. P.S. Modni Policie hodnotila obleceni vsech vyznamnych hostu Ceskeho Lva zde. Za sebe jeste dodavam velke diky a XOXO Kate&Kate do showroomu. no, jenze na tobe to proste vypada jinak...lip... vlastne v kombinaci s tou bundou uplne skvele!